My German is a bit rusty so I put it through the Google translator. 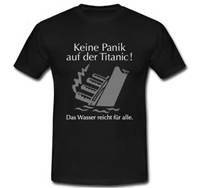 The line above the image literally translates No Panic on the Titanic! and the bottom The water is sufficient for all. In English, the best meaning might be Don’t Panic! There is water for all. Now before you get a bit upset remember this is just a bit of fun here. It sort of fits in with the German sense of humor. Of course if you have other suggestions as to what it could say, drop us a line.